The tall poppy syndrome is real. We don’t want to come across as being ‘full of ourselves.’ However, when you’re in business or representing a business, we have to stand out, we have to be seen. Every. Single. Day. There are various methods to stand out. Now before you go and buy a chicken suit and stand on a street corner, Social Media can and does help. TradiePad has had great success on a budget of only $1 a day. It can be a challenge to select a Social Media channel and then make sure you know how to use it. TradiePad started working with Serena Dot Ryan in May 2017 and established their online presence including learning what, how and when to create and publish content to achieve their business goals. Facebook is the largest Social Media Channel with over 2.1 billion users, it is a great place to start. Traditional marketing is to have a brand or company to connect with and do business with. However, the critical ingredient that makes business happen is people, and the personification (aka humanisation) of a brand. So with people using Social Media to primarily to connect with people, if you only go onto Social Media to share what you do or what your product or service is, with only a business page, you miss a very big opportunity. This is where Public Figure Pages come into their own. A Public Figure Page enables you to separate your business posts from your personal profile. 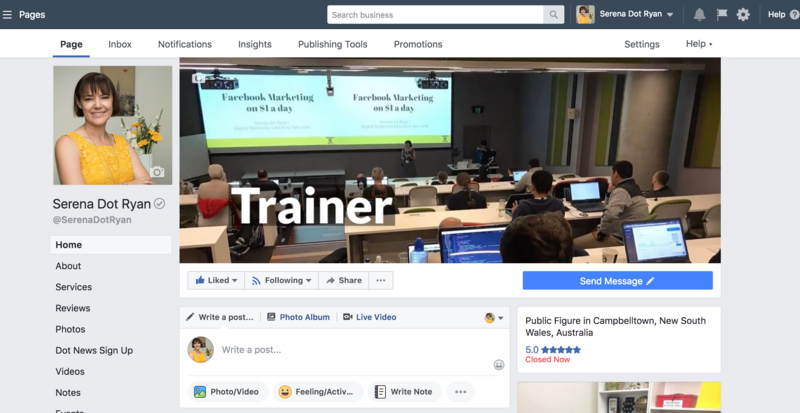 Having a Public Figure Page enables you to do business on a personal level, separate from your family and friends connections typically via your personal profile. You may be thinking do you need a public figure page if you already have a business page and a personal profile? Most people in business should have both a business page and a public figure page. A business page promotes what you sell, whilst a public figure page shows who you are. There are a few exceptions to this where people whose name is their business e.g. freelancers, artists or entrepreneurs (like me) who have a business page associated with their name. With your Public Figure page you can share why you started business and talk personally about your passion for your business. This is powerful and immediately sets you apart from your others in your industry. As your story, your experience and reason for your business is unique to you and this is regardless of whether you are a product or service business. The key is to then, once you have a Public Figure page, share your why for your business. Articulating your passion in a video and sharing it, is powerful. It enables others to connect with you and your story. When someone can connect with you on a personal level it starts a relationship based on the same values. Having a purpose greater than yourself or your business to motivate you, helps. It helps especially when you’re having challenging times. When people connect with you on a personal level, this enables them to be more receptive to hearing what you have to say regarding your why, how you do what you love and ultimately be more likely to purchase from you. The best possible outcome is that you end up with customers and clients who share the same values as you. The benefit being you love doing what you do even more because you are enjoying spending time with amazing clients who share the same values as you. To be clear though, just because someone has connected with your why, you don’t immediately start selling your product or service. If you do this, you’re missing the point. It would be like proposing on the 2nd date, it would be rare that you would get a yes! There is no one size fits all when it comes to Public Figure Pages. I currently only have a Public Figure Page. I enable business to be conducted through it. For clients, depending on the stage of business they are in, they may have a Business Page as well as Multiple Public Figure Pages. In February 2018, Clinton Cowin from TradiePad published his Why video on his Public Figure Page. Then with a budget of $1 a day, an ad to share this was set up. A custom audience of ideal customers being created at 2.9 cents per 10 second view. Doubled Social Media Traffic to Website. All this on a budget of $1 a day. How could you introduce Public Figure Pages for your business? Use this checklist to get set up.